Offering you a complete choice of products which include baby gift set, new born gift set and kids gift sets. 15 PC BABY GIFT SET comprises the entire range of clothings for a New Born baby. Items in the gift set include Two T-shirts, Body Suit, Baby Blanket, Bib, Pant, Sorts, Cap , Mitten Set , Bootie Set and Wash Cloths. Attractive packing with vibrant and relevant colour boxes are added product features. 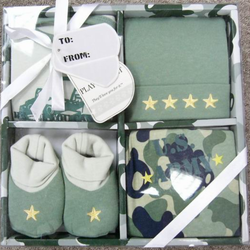 4 PC GIFT BOX is the perfect cost effective item comprising the Basic clothing of the New Born Baby. It includes T-Shirt,Cap,Mitten Set and Bootie Set. Owing to our sophisticated infrastructure facility, we have been able to manufacture, supply and export Kids Gift Sets. Our offered sets include body suits, mitten, bottle, towels, bib, caps and garments that are manufactured with perfection in different designs, colors and patterns. In addition, without compromising with the quality of the products, we have mustered huge client-base. Looking for BABY GIFT SETS ?